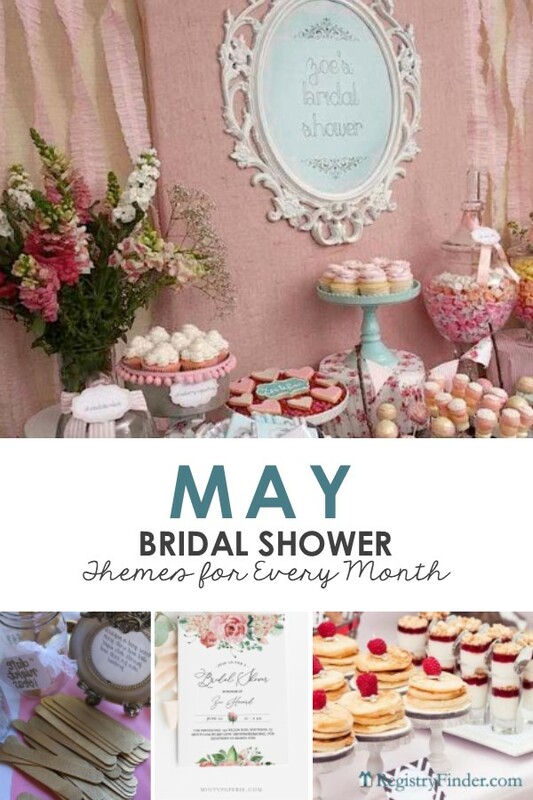 While summer and fall may feel like the time you’re attending all your friends’ bridal showers and weddings, the truth is that weddings and showers happen all throughout the year. 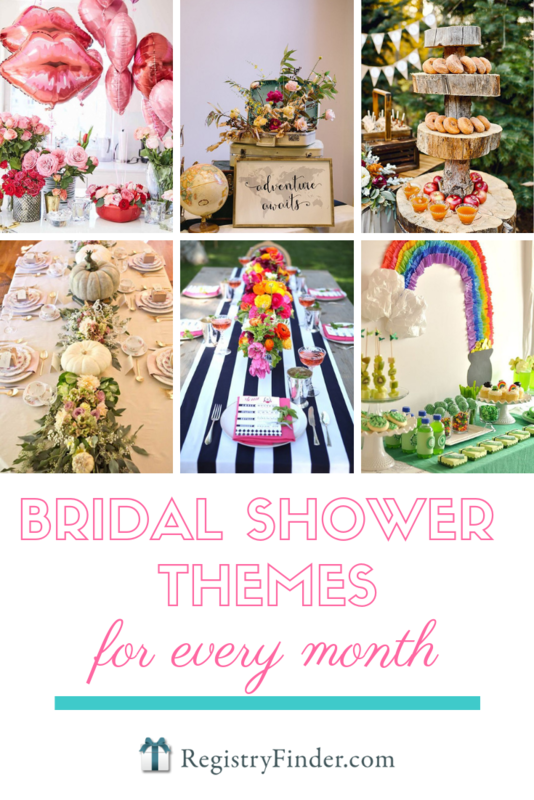 It’s easy to think up a cute and creative bridal shower in July or October, but what about the dreary winter months of January or February? With our tips, we believe it’s possible to throw a creative and thoughtful shower no matter what time of year the wedding will fall in. We’ve combined some of our best themes, invitations, games, and menu ideas all into one post just for you. You can also find all of these ideas over on our Pinterest board. Scroll through until you find the month you need and then get to planning! We can’t wait to see what you come up with! 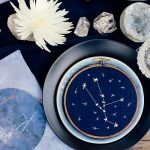 This sparkly invitation from Etsy seller PaperHeartCompany is the perfect way to celebrate all the beautiful parts of winter. Warm up with a hot cocoa bar at this festive bridal shower. Get creative with toppings like Heath bar bits, peppermint or raspberry syrup. Have guests hang wishes to the new bride and groom on a shimmering wishing tree. Keep centerpieces simple, yet glittering. A silver runner topped with votive candles will cast a beautiful wintry glow on your event. Give an ode to the month’s classic holiday by hosting a Valentine’s themed shower. It’ll be easy to celebrate love with hearts floating all around, like the ones found on this perfect Valentine invitation from JMCustomInvites. It wouldn’t be Valentine’s Day without copious amounts of balloons and roses. Pick up some lip-shaped and heart shaped balloons to accent your food table. Run vases of red and pink roses down your tables as the centerpieces. We love the simple and sweet look of these heart shaped tea sandwiches. Pair with a large colorful salad and pitchers of sweet tea and you’ll have a beautiful Valentine’s party spread. Spread the love with this fun game from GraphicWisp. Match movie quotes to their classic romantic comedy and whoever guesses the most correctly wins a prize! 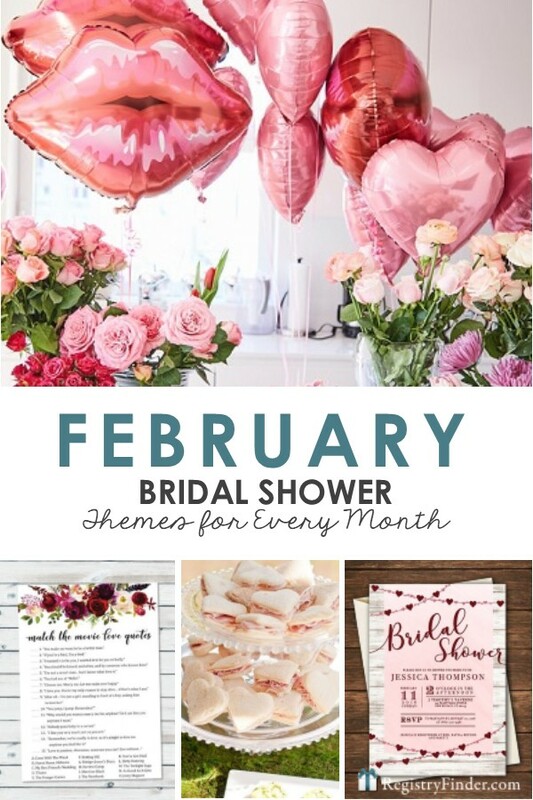 Head over to our comprehensive Valentine’s Day Shower blog post for more Valentine’s Day shower ideas! Celebrating the Irish bride-to-be in your life? 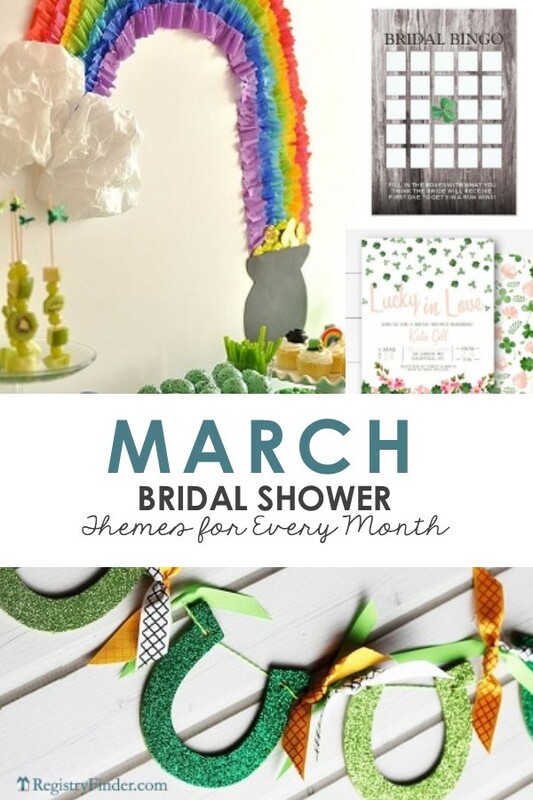 Consider throwing a “Lucky in Love” themed bridal shower this March. These adorable green and pink shower invitations will set the tone for a fun day! Don’t forget to ask guests to dress in green! Any good St. Patrick’s Day theme needs all green everything and a pot of gold at the end of a rainbow. Gather up all the green foods you can find, such as green cake pops, a veggie tray, kiwi, grapes and green licorice. Then craft a cute paper streamer rainbow like this one! String this sparkly horseshoe banner for good luck throughout your shower space! Play a lucky round of bridal shower bingo with this cute board from Zazzle. Guests fill in the blanks with gifts they think the bride will receive, then they mark it off with a gold coin as she opens it. The first guest to get 5 in a row and yell “BINGO!” wins! April showers can bring more than just May flowers. 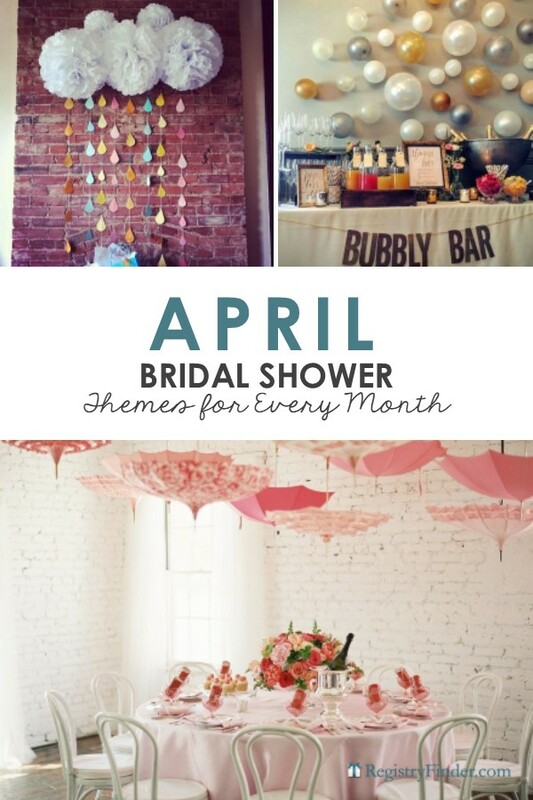 What about throwing an April showers themed bridal shower? A sweet umbrella invitation will have your guests so excited about celebrating your spring bride-to-be. Pick up a few cute umbrellas and hang them upside down from the ceiling. Fresh spring flowers will make the perfect simple centerpiece underneath! A few pom-poms and some colorful raindrop cutouts will make an adorable backdrop to your shower’s food or gift table. Any rainy spring day calls for a mimosa bar! Set up your drink station with champagne, orange juice and a variety of fruit toppings. Have a shabby chic bride in your life? Start planning a vintage-inspired spring bridal shower for her! Invite guests with this printable invitation from Etsy seller MintyPaperieShop. Decorating for a shower has never been easier. 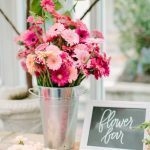 Pick up assortments of springtime wildflowers from your favorite florist and use pieces like old mirrors, silver tea kettles, vintage tea cups and classic watering cans to display all your decor and food. Ask guests to share their best date night ideas for the soon-to-be newlyweds. Some of our favorite ideas include: living room camp out, stargazing and taking dance lessons. A classy breakfast spread is the perfect way to celebrate at this vintage springtime shower. Cook up mini pancakes, set up a yogurt parfait bar and order some mini muffins. Serve it all on silver platters! 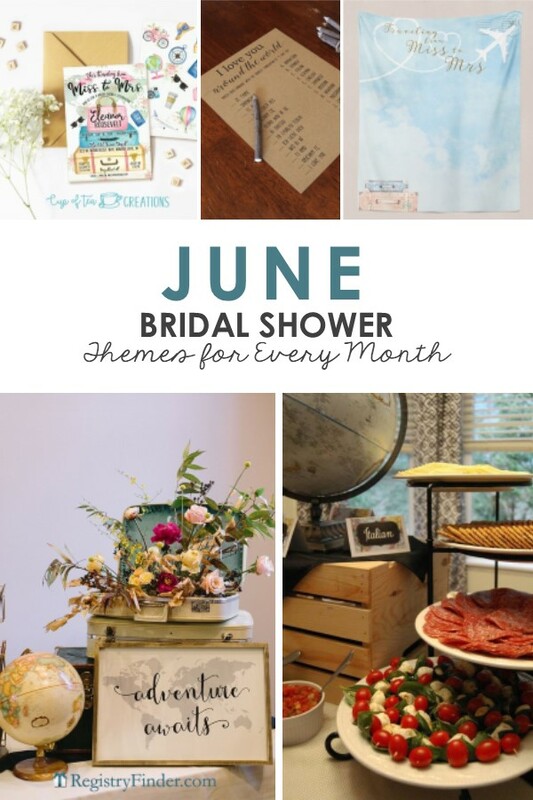 Kick off the summer with a sweet travel inspired shower for your globetrotting bride. We love the whimsical spin CupOfCreation put on these travel themed invitations. Transform your event space with globes, vintage suitcases and world maps. Accent these pieces with bouquets of wildflowers and quotes like, “You’re my Greatest Adventure!”. “I Love You Around the World” is the perfect game to pair with your travel themed shower. Guests will match which language they think the “I Love Yous” on the left side of the page come from. The guest with the most matches wins! Any great trip needs a lot of photos to capture the memories sure to come. Order this photo booth backdrop from PaperRamma so the bride can have pictures taken with all her guests. Pick a few choice destinations from around the world, such as Italy, Mexico, China and the Middle East then plan your menu around these countries. Create stations filled with each country’s most popular food such as antipasto salad, mini street tacos, egg rolls and a hummus and olive tray. Check out this post for more Travel themed ideas! It only seems fitting to throw an Americana themed bridal shower during America’s birthday month! 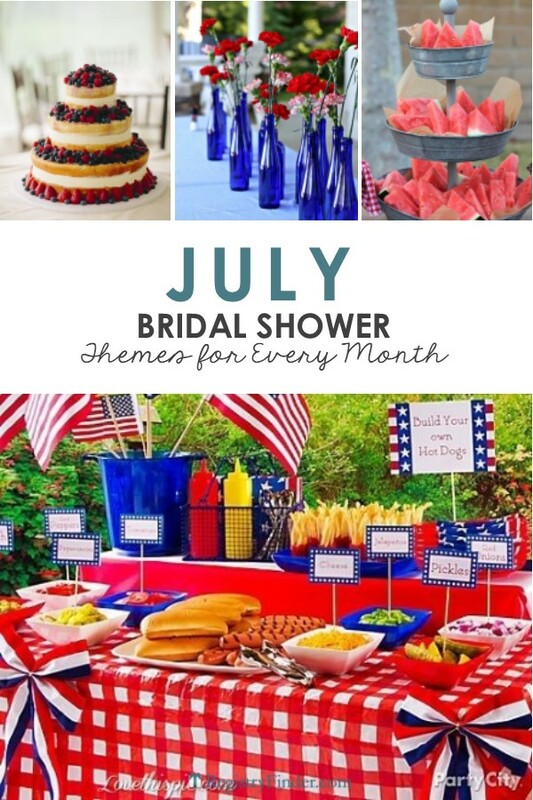 This is a great month to host a co-ed shower with a backyard BBQ theme and red, white and blue everything. We love this invitation from MolsDesigns to set the tone for this summertime soiree. Throwing a 4th of July themed bridal shower means food will be a walk in the park. Elevate an American classic with this build-your-own-hot dog bar. Display watermelon all around the party in galvanized serveware, like this tiered tower. Let the cake be the main attraction by covering it in strawberries and blueberries and lots of whipped cream. Keep the fireworks alive with this adorable banner from Etsy seller, WineCountryBanners. You can personalize it with the bride’s wedding date! Simple blue bottles filled with red and white flowers can act as beautiful tablescapes and accents on the food and gift tables. You can’t let summer end without a full-on fiesta. 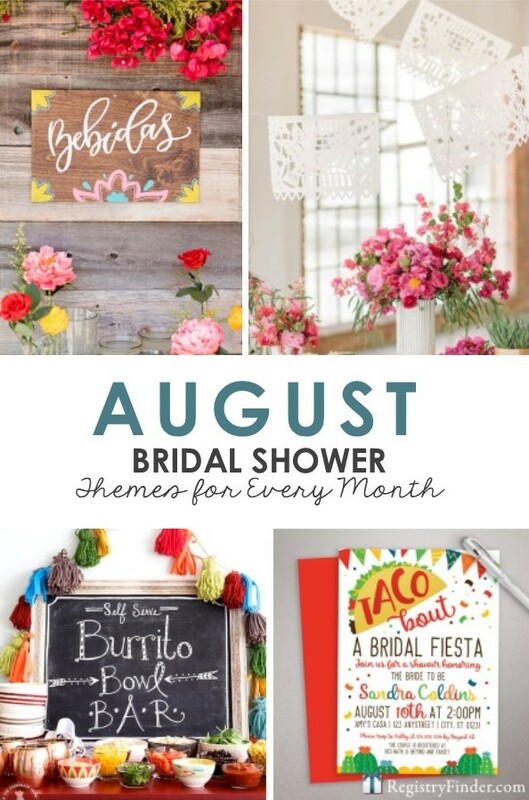 For that taco-loving bride in your life, start planning an August bridal shower with all the bright colors, chips and salsa and mini margaritas her heart desires! 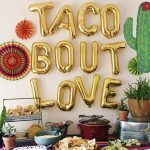 This taco invitation by LittleBeesGraphics is a festive way to ask guests to attend the shower. Hot pink flowers, cacti, succulents, gold accents and paper flag banners are the best way to usher in the fiesta vibe while still keeping this shower a classy and bridal affair. 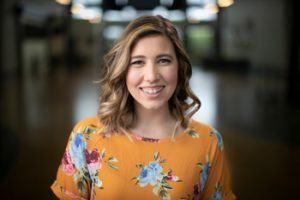 How well do guests know the bride? Have them test their skills with this printable “Would She Rather” game that perfectly matches your theme. Whoever scores the highest wins a prize! Put together a self-serve burrito bar with everyone’s favorite toppings, like guacamole, salsa, rice and beans. Mix up a pitcher of margaritas and have guests serve themselves at a festive “Bebidas” (or, “drinks”) bar. As summer fades to fall, consider throwing a preppy bridal shower. Incorporate all the end-of-summer colors and patterns like navy blue gingham, pink stripes, and white table linens. (Just make sure to get it in before Labor Day.) Any preppy bride needs a good monogram on her invitation, like the one on this invite from MeyerMarketDesigns. Combine navy and white stripes with bright flowers and you’ve got a recipe for a beautiful preppy tablescape! Mixing patterns for a sweet and preppy cake is a must for this bridal shower! 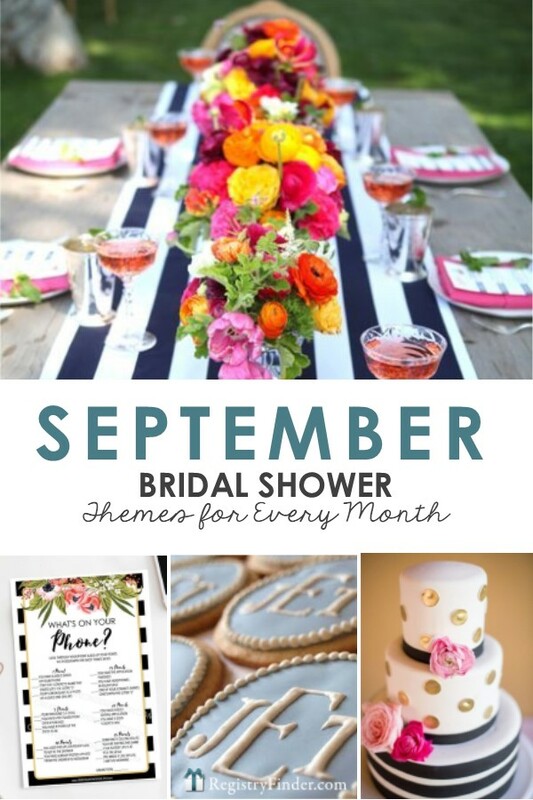 Play a round of “What’s On Your Phone?” at this September shower. Guests earn points by searching through their phone in this mini-scavenger hunt style game. Keep the monograms coming at this shower. Send guests home with the bride and groom’s monogram on a delicious cookie like this one! 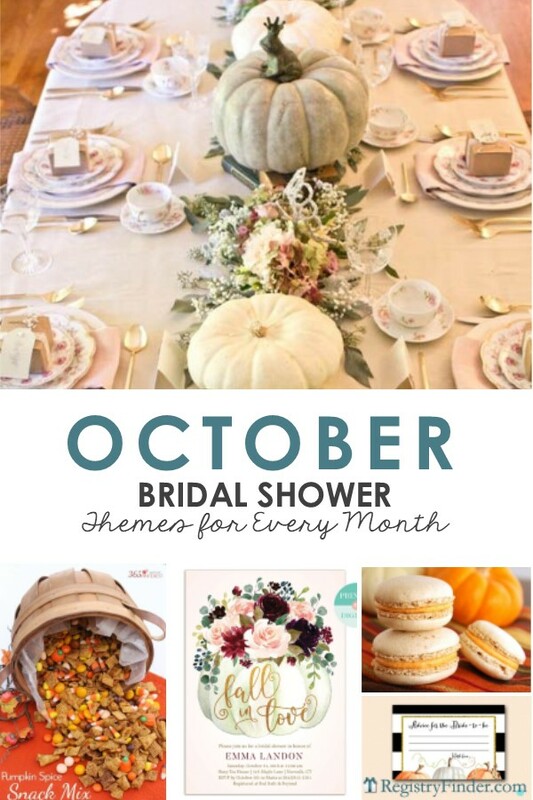 Fall in love with a pumpkin-themed bridal shower during the month of October. These invitations from Etsy seller, LittleRoseStudio put a modern spin on classic fall decor and design. Keep the colors for this shower muted and neutral. Pick up white pumpkins, mixed greenery and pale pink and cream flowers to create a gorgeous table runner like this one. Obviously, an October bridal shower calls for pumpkin spice everything. A few of our unique favorites include pumpkin spice macarons, pumpkin spice party mix, and a pumpkin pie cheeseball. 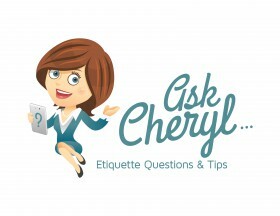 Ask guests to share their best newlywed advice with the bride to be. They can write out advice on these adorable cards and then you can collect them in a pretty box or binder for the bride to read through later. The bride-to-be in your life has a lot to be thankful for as she looks forward to forever with the love of her life. 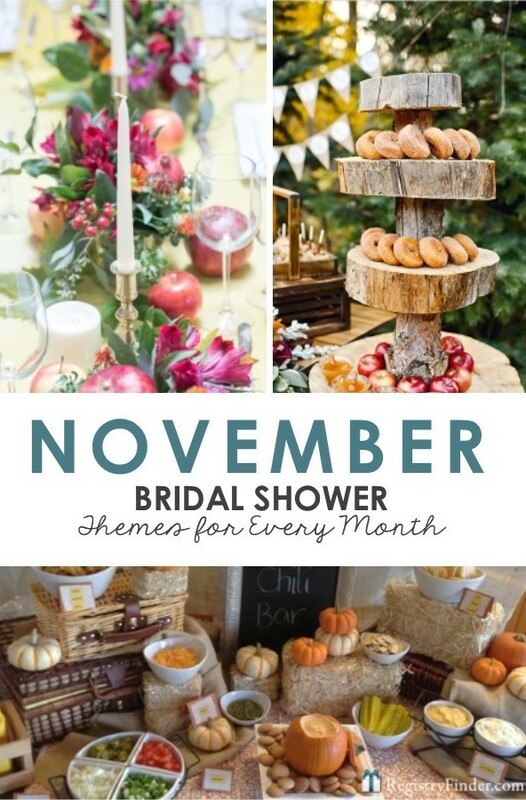 Celebrate all those blessings at a rustic, autumn-themed shower. Create an apple cider and mini donut station for guests to enjoy. A DIY chili bar can be the main attraction of this shower. Put out the best toppings and decorate with hay bales and pumpkins. The holidays are a great time to remember family traditions. Start the bride and groom off on the right foot by asking guests to share their favorite family traditions at the shower. Gather fall florals and candlesticks to create the centerpieces for this fall shower. Consider adding in cornucopias and berries to accent as well. 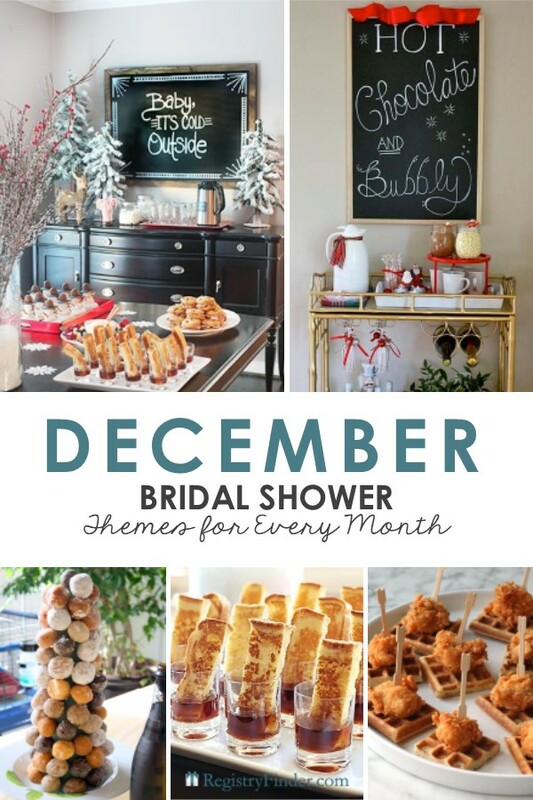 The holidays can start to feel busy, especially if you know a bride planning a wedding, so consider doing a December brunch shower. Invite guests for a Christmas themed brunch and bubbly party and do it in style with this invitation from Etsy seller, LilyPadBoutiqueStore. Chances are, your home will already be decorated for Christmas so no need to reinvent the wheel for this shower. Add a tall centerpiece like this vase full of berries and gather up mini Christmas trees to spread throughout your house. Your Christmas brunch menu should definitely include fun options like this Christmas tree of donut holes, mini french toast sticks and mini chicken and waffles. 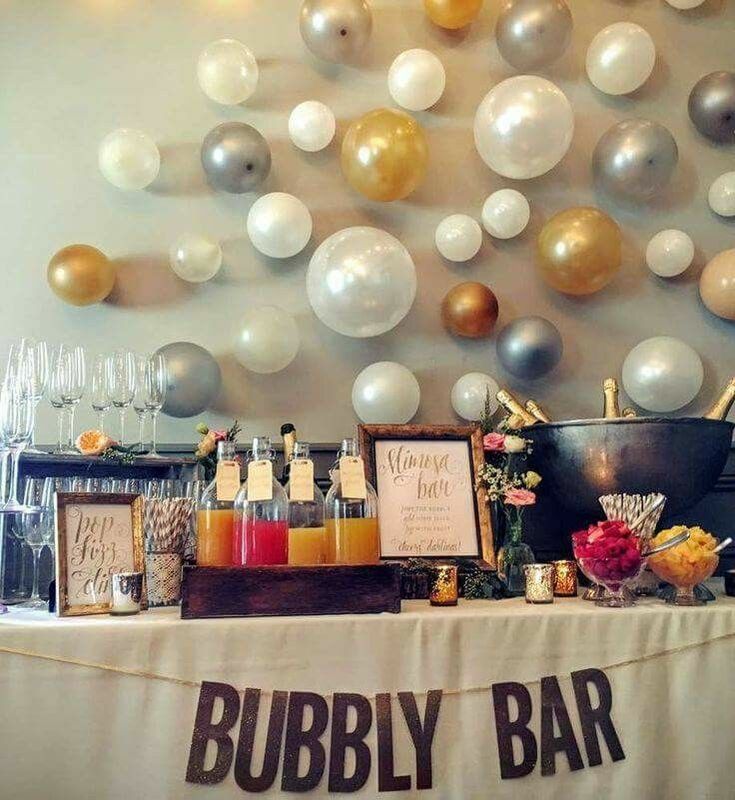 Create a combined drink station for both hot chocolate and bubbly. 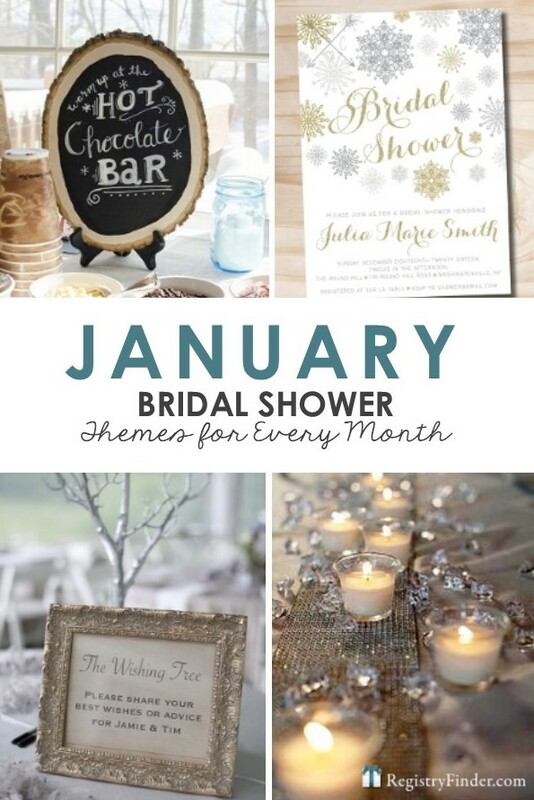 For more beautiful Winter Bridal Shower ideas, check out our blog post, Five Winter Wedding Shower Themes You’ll Love. Bridal shower planning doesn’t have to be hard, especially with the help of our Registry Finder Give It Blog. We have party ideas for every season that will make you the hostess with the mostest! Your guests will have it easy too by finding all the bride’s registries in one spot at RegistryFinder.com. -Written by RegistryFinder.com contributor Sami Moss, who loved her navy and yellow nautical themed bridal shower.